While working on a project recently, I realized that it would be pretty handy to have some extra pockets to keep the teeny-tiny Photography bits sorted and easily accessible and hence came into my mind the name “Photographer’s Vest”. I remember when I first started with photography I used to have this image on professional photographers with big bulky gear and a khaki vest in my mind. Since now I myself was doing pretty good in this field and situation allowed me to squeeze myself into one, I though it would be a good idea to realize that childhood avatar in my own-self. 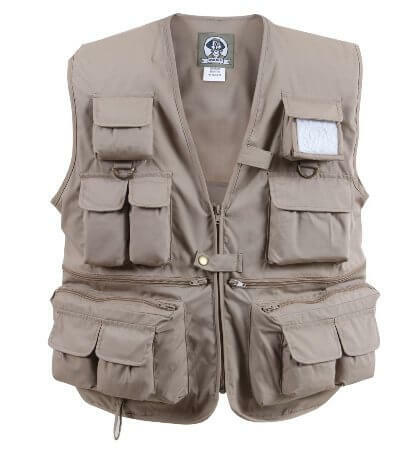 So stuffed with all the excitement I could bear, I started my search for a perfect “Photography Vest”. But soon enough to my surprise, I realized that there were more options for fishermen than photographers in market. Now as there is not much of a difference in the vest itself rather than the name because all you need is big pockets, breathable fabric and reliable quality. With those features in my mind I narrowed my choices to these 10 awesome vests from various sections. 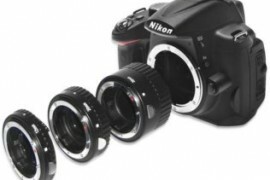 Now some of them are dedicated for photographers and hence bear a big price tag and yet the others with completely identical set of specs are meant for fishermen and thus come a lot cheaper. So here they are in ascending order of my liking and recommendation, rest I leave up to your heart to choose for yourself. Riot Threads Photo Journalist’s Vest is made of durable and breathable 100% cotton material. Numerous pockets are there on this vest. There is mesh lining on the back of Riot Threads Photo Journalist’s Vest for ventilation. Full fitting – Perfect garment for photographers, travelers and adventurers. The openings on front pocket are too small for most lenses. Riot Threads Photo Journalist’s/Photographer’s Vest is a bit stiff and noisy (can improve with washing). 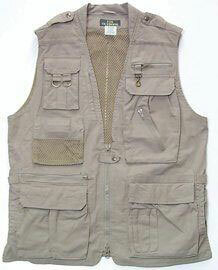 CampCo Humvee Safari Photo Vest is made up of 100% Cotton. 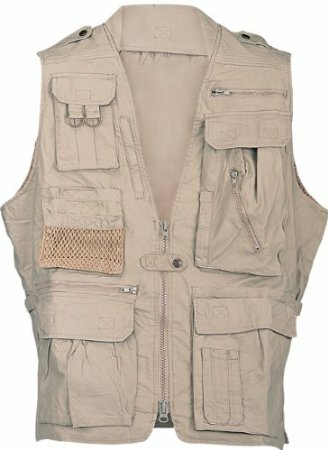 Huge inside pockets are there on this CampCo Humvee Safari Photography Vest. Picking the right size can be tricky. Zippers on the CampCo Humvee Safari Photo Vest aren’t top notch. 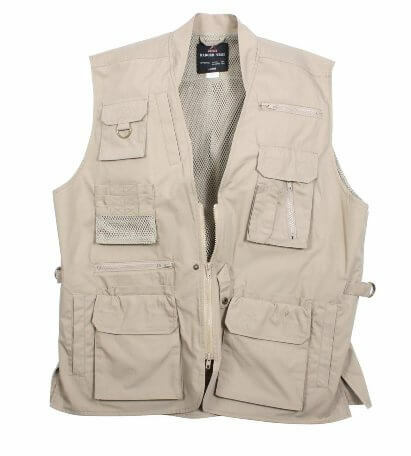 Rothco Deluxe Safari Outback Photography Vest has stonewashed cotton Mesh lining. Vented back keeps you cool in hot climate. Rothco Photography Vest holds 18 Pocket, enough to pack all kind of stuff. Snap closure is a nice add on. 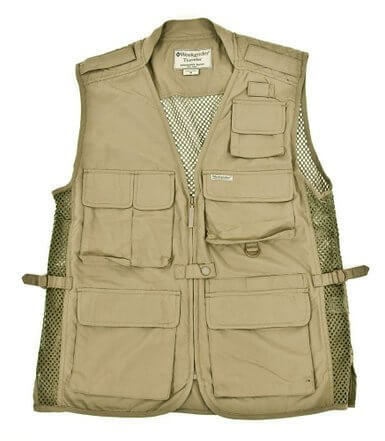 Rothco Deluxe Safari Outback Photography Vest is a bit pricey for the quality and design. Pockets are relatively small though more in number. Rothco Military Type Recon Photographer’s Vest is totally water Resistant! This vest offers you 10 Pockets. Waist Drawstring is there to get you better fit. It’s made up of nylon making it pretty strong and durable. Sleek Design and Comfortable to wear. 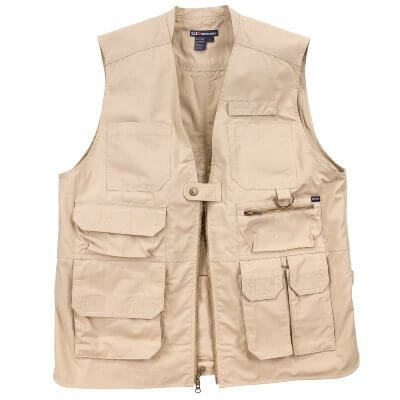 5.11 Poly/Cotton TacLite Pro Photography Vest offers tons of pockets (17) to accommodate a lot of stuff.. Build Quality is exceptional for the price. Various color options are available to choose from. Best concealed vest you can find on the market. 5.11 Poly/Cotton TacLite Pro Photography Vest is a bit on the heavier side. With 17 Pockets, Belt loops and D-ring, the Rothco Uncle Milty Travel Vest for Photography is a versatile one. The cotton and poly mix fabric looks durable. Velcro patch for fisherman to attach their lures, which is removable if you are not into that kind of thing. Fabric is not breathable on the Rothco Uncle Milty Travel Vest for Photography but this can be a pros while using in cold climate. 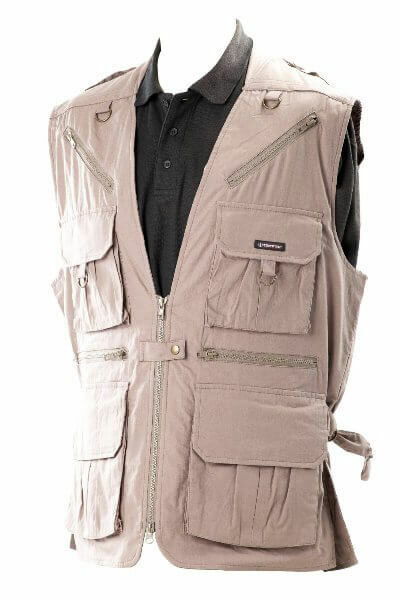 This vest is unisex though shoulders can be a little bit too wide for females. 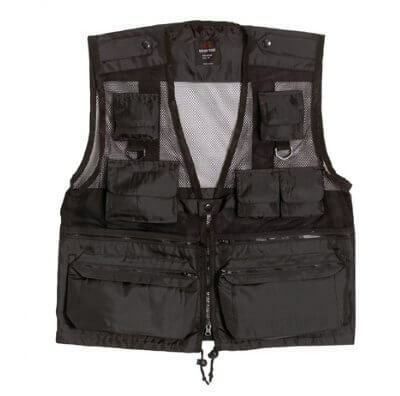 Rothco Plainclothes Concealed Carry Photography Vest has Back vented with mesh lining. There are 16 front pockets with zipper along with hooks and loop closures. Rothco Plainclothes offers an adjustable waist with tabs for customization. Fabric looks durable and made for rugged usage. 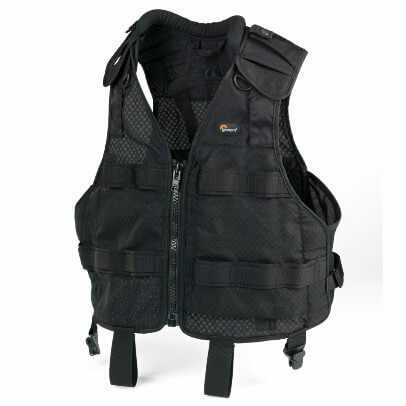 Rothco Plainclothes Concealed Carry Photography Vest can have zipper problem after using a while. Pockets are oddly shaped and finishing is so so. Excellent and discreet ventilation is there on this vest. Tamrac 153 – World Correspondent’s Photographer’s Vest features ten pockets on the front as well as four “D” rings for various accessory attachment. Tamrac Vest comes in 6 sizes namely – small, medium, large, XL, XXL, and 3XL. Two zippered side pockets for additional space along with small pockets for film and accessories. 100% cotton built with nylon mesh vents. Tamrac 153 – World Correspondent’s Photographer’s Vest is made up of Lightweight material, which in my opinion can hardly sustain for one year. The Weekender Traveler Air Photographer’s Vest Air Vest has pockets for everything, cellphone, maps, film, more. Rear pocket to hold a water bottle. This photography vest provides a security zip pocket. Weekender Traveler Air Photographer’s Vest is water repellent. Tailored, lightweight and flexible design on Lowepro S&F Technical Vest for Photographers provides a comfortable fit and supports waist when paired with the S&F Deluxe Technical Belt. 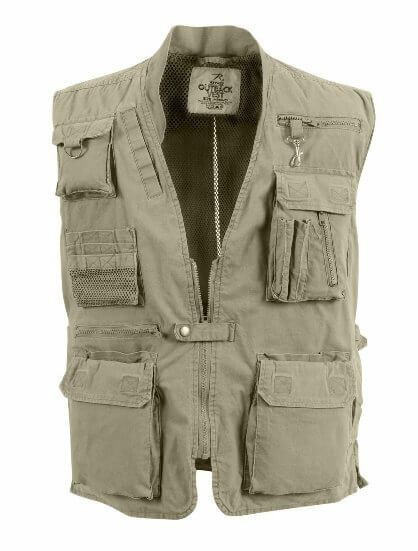 This vest is also compatibile with the S&F Light Utility Belt. Takes the weight off your neck and distributes it on the whole torso. Gives you a little bit of lower back support. Makes you look like a true professional. Beware of the size with Lowepro S&F Technical Vest for Photographers while purchasing off the amazon.